We got a 40F=22C drop in temperature yesterday. 2:03. A belated Good Morning, Anne, Wolf, everyone! I have the kiddos coming this afternoon. Mom and Dad are going to a show in Baltimore tonight, so the little ones are spending the night here. We shall see how it goes. I'm not concerned about the 4 and 6-year-olds but the 2-year-old might find it strange. I'm pretty sure he'll end up in bed with me. I hope Plum checks in and lets us know how the end leg of her travel went. It was certainly prudent for them to stop and wait considering the weather conditions. Morning all. shosho was right on time. I wanted to hear about your crockpot ribs yesterday, Kathy! Morning all, our weatherman got it right at last, we had good soaking rain all night. The grass looks greener this morning. G'day Folks and especially all POOZLERS, here is your Saturday Brain Teaser. Thanks, Kathy - I'll have to try that method & I bought liners quite a while ago & haven't had reason to use them - great suggestion - thanks! Well lokee here - A Wombat Poozle - yippee! That photo looks like an artistic demonstration of mountainous perspective using ever darker silhouetted cut-outs! 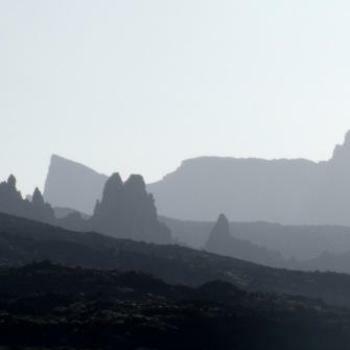 And yet ... it is a photo of an actual mountain range in Tenerife! WOW! Time to get on with the day after an extra-long run this morning. I have a marathon in a little under five weeks so it's time to get serious about training! I don't know why Chris just doesn't get himself a car. It would be much easier. Thank you all for the birthday wishes! I had a fun day starting with a second grader making me a construction paper crown to wear and ending with dinner out, and dessert and presents at my daughter's house. I'm finally a Supporting Member again. No more damn adverts jumping around the screen and I've got my smilies back again. Hooray!!! Yippee Anne, those adverts are a pain in the neck. Even though it was only for a few days while I got my membership sorted out. If we make it, please ask the barman to put a Ba Muoi Ba beer in the fridge for me. It's only been for a few days, Amelia, but damn annoying.